A big thank you goes out to Salvo, my Sicilian fan, who just sent me copies of my work in Italian. 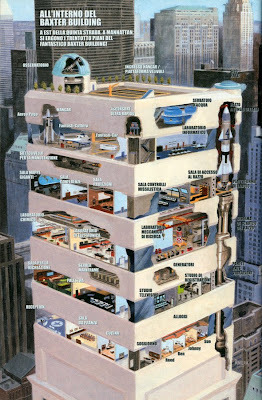 Pictured above is my cut-away illustration of the Baxter Building from Mythos: Fantastic Four. Now I know how to say "Fantasti-Car" in Italian. You can see the English version, as well as some process information, here. My internet connection is currently on "Island Time," meaning it transfers data whenever it feels like it. I'm eagerly awaiting Fedex to deliver my new Epson R1900, a large format (13 x 19) printer. Yesterday, I was informed that my long-awaited female anatomy figure will be here next week. I still can't talk about my awesome new Spider-Man project. But I did just accept a Wolverine cover gig. And, most importantly, my girlfriend has returned safely from her 7-week European vacation! 'Bout time! It's much appreciated, Salvo. I'll probably post some more scans from the books eventually... esp. the one that says I was inked by Tim Townsend. Thanks Äxl! Happy new year to you as well!